Dr. Vasudev Patel presenting the FIA memorandum to General V.K. Singh, Minister of State, External Affairs. Photo by Suresh K. Volam. Atlanta, GA, December 3, 2018: Federation of Indian-American Associations of Georgia (FIA Georgia), representing nearly 200,000 Indian-Americans in the state, formally sought the assistance of the Government of India in establishing direct flights from Atlanta to major Indian cities like Mumbai, Ahmedabad, Hyderabad, New Delhi, Bangalore and Kolkata. 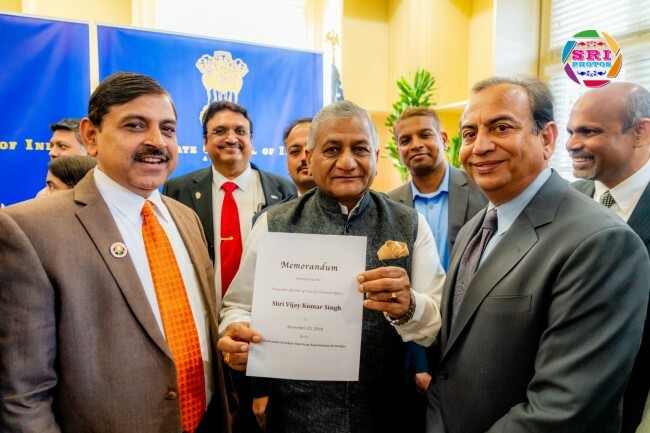 Dr. Vasudev Patel, President of FIA Georgia, submitted the memorandum to Minister of State for External Affairs, General Vijay Kumar Singh during his visit to Atlanta on November 25. The Minister promised to assist the community in establishing direct flights through India’s state carrier, Air India. “He said this is a very good suggestion and felt that the Atlanta region certainly deserves this type of service. He promised to work on it with us,” said Dr. Patel. At present, Air India has direct flights only from other US cities like Newark, New York, Washington, Chicago, Los Angeles and San Francisco. Direct flights from Atlanta to Indian cities will make it more convenient for passengers travelling to India from the Southeast US region. It will also make it more affordable for passengers travelling from this region.